Yucca gloriosa 'Variegata' is a slow-growing, ornamental, flowering shrub and arguably the most attractive of all the selected cultivars within the genus. It is an evergreen species and despite originating from the subtropical climates of coastal Southeastern United States it has proven capable of surviving temperatures down to an impressive -9 degrees Celsius. In fact there is anecdotal evidence that Yucca gloriosa 'Variegata' can tolerate temperatures as low as beyond -18 degrees Celsius although there was no mention of its condition once the freezing weather had passed. Its sword shaped leaves are 30–50 cm long and 2-3.5 cm wide and highly architectural making it a popular choice for tropical effect planting schemes. Under favorable conditions you can expect Yucca gloriosa 'Variegata' grow to heights above 4 metres however in the milder regions of northern Europe height of between 1.5-2 metres are more likely. 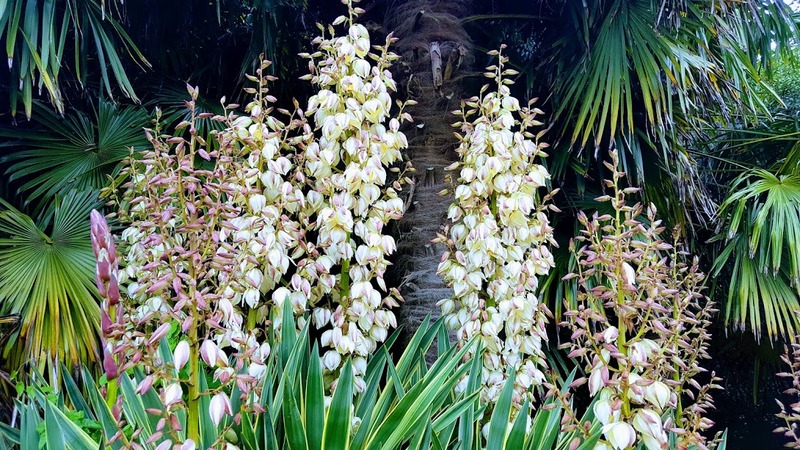 The creamy-white, bell shaped blooms are formed in panicles up to 2.5 metres tall. If pollinated leathery, elongated berries are produced which can be up to 8 cm long. 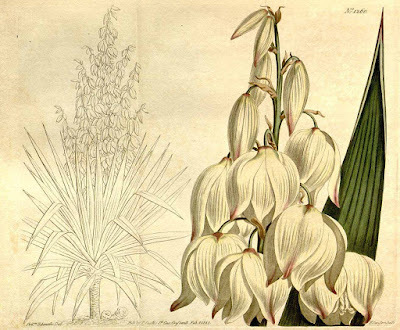 In its natural habitat, the original species Yucca gloriosa can be found growing among the sand dunes along the coast and on barrier islands. Of course, the successful garden cultivation of an non-indigenous plant species involves nothing more than replicating the plant's native environment as best as you can. For northern European climates this can be achieved by planting Yucca gloriosa 'Variegata' in full sun. It will tolerate light shade, but growth will be considerably slower and a looser, untidier habit will develop. Furthermore, the highly ornamental blooms are unlikely to be produced. In colder, temperate climates it would be prudent to provide a sheltered position against the protection of a south-facing wall. Drainage is particularly important for most yucca species, and as you would expect from its native habitat, Yucca gloriosa 'Variegata' will perform best in a free-draining sandy, or chalky soil. That being said, it has proven to be a robust cultivar and will grow happily in most garden soils. Try to avoid planting in heavy or clay soils and in particularly any soils which are prone to waterlogging. If ideal conditions are not available, improve the soil by digging plenty of organic compost of horticultural grade grit before planting. In heavy soils or soils prone to waterlogging create a mound proud of the soil surface and plant the yucca in that. Soil acidity or alkalinity is of no real concern unless it is moving towards the extreme. Yucca gloriosa 'Variegata' received both the First Class Certificate in 1883 and the Award of Garden Merit in 1984 from the prestigious Royal Horticultural Society. WHAT IS A GROUND SLOTH? CAN FLYING SQUIRRELS REALLY FLY?